Due to overpopulation, lack of natural resources, no public education, and a surplus of political bickering, Earth is a cesspool and our solar system’s colonies have failed. Nevertheless, outside our solar system, exploration has thrived. Encouraged by the conquest of Kipos, idealistic dreamers look beyond Earth to build a utopia from the abandoned Lunar Colony Serenitatis. Industrialists reconstruct the colony, but struggle to turn a profit while encouraging scientific discovery. Brimming with hope despite intense uncertainty and physical hardship, the impoverished Ella Sethdottier follows rumors of plentiful jobs on the moon. On roads fraught with danger, she discovers Earth is a bigger place than she ever imagined, but Serenitatis is little more than a prison colony. Ella forges unlikely friendships with corrupted androids and the quixotic prison doctor, Ian Whitlatch, who champions equality and rights for inmates. Amid corruption and nobility, tragedy and victory, the fate of the colony hangs precariously in the balance. 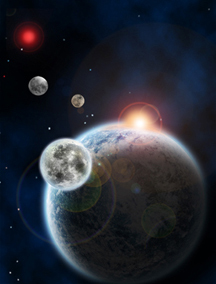 Kerry Cross (KerryBerryBooks) "Dystopia and space = a win-win for me!" Janice Clark (Tea with a Black Dragon) "Guizzetti is something of a modern day Dickens..."
Would you go to a planet that has never known war, hunger, or even a single murder? Without an influx of human DNA, the utopian colony on Kipos has eleven generations before it reaches failure. Earth is over ninety light-years away. Time is short. When Abby wakes up on Kipos, Jin cannot be found. Orchid is ripped from her arms as Abby is sold to a dull-eyed man with a sterilized wife. Indentured to breed, she is drugged and systematically coerced. To survive, Abby learns the differences in culture and language using the only thing that is truly hers on this new world: her analytical mind. Haunted by the agony of her loss, but determined to make a better life for herself, she joins a planetary survey team where she will discover yet another way of life. Available on Paperback and E-book! Dan Thompson "Kipos is a planet on the decline; generations after generations are succumbing to a failed reproduction law and are desperate for solutions. You can get sucked in to the entire political situation of Guizzetti’s world and it almost serves as a dual storyline alongside Abby’s turmoil." The Red Reader "I can guarantee when you're reading Other Systems, not only will you be enthralled by the world Guizzetti creates but you'll be right there alongside Abby and her friends." Books are my way of Living! "The story never lack emotion, because between the travelling through space, the crew on the revelation and Abby’s mind you are always reading something new and having fun..."
The World Revolves around Books "This book was nothing like I imagined it would be. It was a hundred times better." Mallory Heart Reviews "...good sci fi (or horror or Supernatural, paranormal, fantasy, etc.) asks THE BIG QUESTIONS. 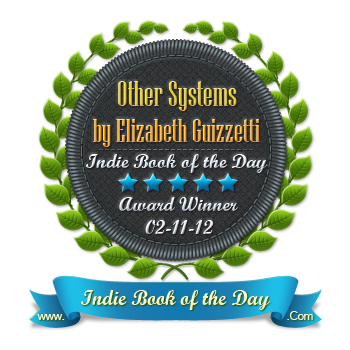 Such is the case in “Other Systems,” author Elizabeth Guizzetti’s debut novel, which sets those philosophical, social, and cultural queries against a background of intense, complex, delightful world-building."